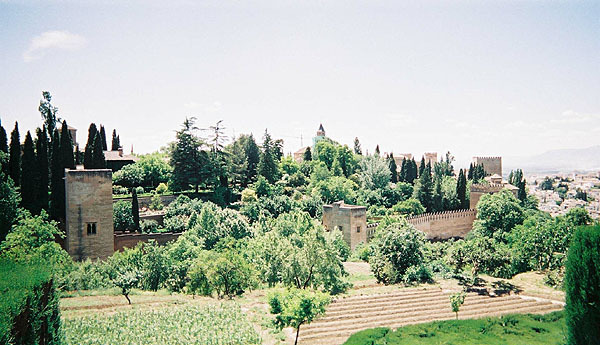 The Alhambra is an ancient palace and fortress complex of the Moorish monarchs of Granada. This terrace or plateau is enclosed by a strongly fortified wall, which is flanked by thirteen towers. 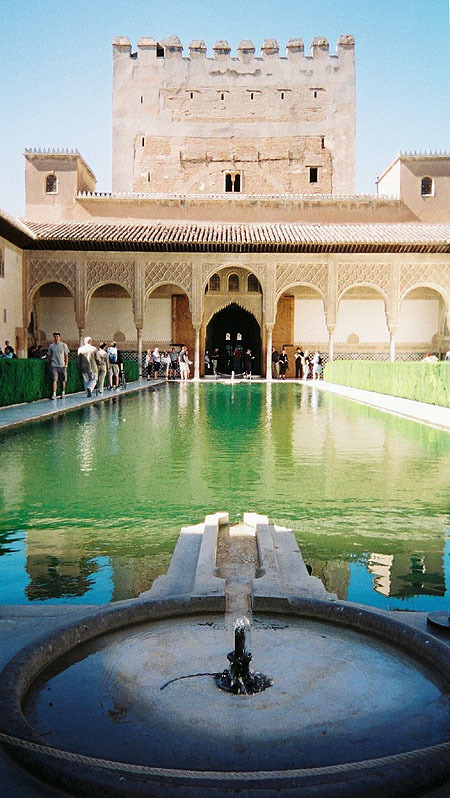 The name Alhambra, signifying in Arabic the red, is probably derived from the colour of the sun-dried tapia, or bricks made of fine gravel and clay, of which the outer walls are built. Some authorities, however, hold that it commemorates the red flare of the torches by whose light the work of construction was carried on nightly for many years; others associate it with the name of the founder, Mahomet Ibn Al Ahmar; and others derive it from the Arabic Dar al Amra, House of the Master. The palace was built chiefly between 1248 and 1354, in the reigns of Al Ahmar and his successors, but even the names of the principal artists employed are either unknown or doubtful. 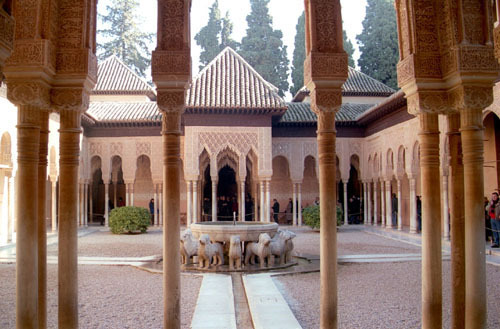 The splendid decorations of the interior are ascribed, among other kings, to Yusef I,Mohamed V, Ismail I, etc… After the christian conquest of the city in 1492, their conquerors began, to alterate the marvellous beauty of the Alhambra. The open work was filled up with whitewash, the painting and gilding effaced, the furniture soiled, torn or removed. Charles V. (1516-1556) rebuilt portions in the modern style of the period, and destroyed the greater part of the winter palace to make room for a modern structure which has never been completed. Philip V (1700-1746) Italianised the rooms, and completed the degradation by running up partitions which blocked up whole apartments, gems of taste and patient ingenuity. In subsequent centuries the carelessness of the Spanish authorities permitted this masterpiece of Moorish art to be still further defaced; and in 1812 some of the towers were blown up by the French under Count Sebastiani, while the whole buildings narrowly escaped the same fate. In 1821 an earthquake caused further damage. The work of restoration undertaken in 1828 by the architect Jose Contreras was endowed in 1830 by Ferdinand VII; and after the death of Contreras in 1847, it was continued with fair success by his son Rafael (d. 1890), and his grandson Mariano. The Moorish portion of the Alhambra resembles many medieval Christian strongholds in its threefold arrangement as a castle, a palace and a residential annexe for subordinates. The Alcazaba or citadel, its oldest part, is built on the isolated and precipitous foreland which terminates the plateau on the north-west. Only its massive outer walls, towers and ramparts are left. On its watch-tower, the Torre de la Vela, 85 ft. high, the flag of Ferdinand and Isabella was first raised, in token of the Spanish conquest of Granada, on January 2, 1492. A turret containing a huge bell was added in the 18th century, and restored after being damaged by lightning in 1881. Beyond the Alcazaba is the palace of the Moorish kings, or Alhambra properly so-called; and beyond this, again, is the Alhambra Alta (Upper Alhambra), originally tenanted by officials and courtiers. 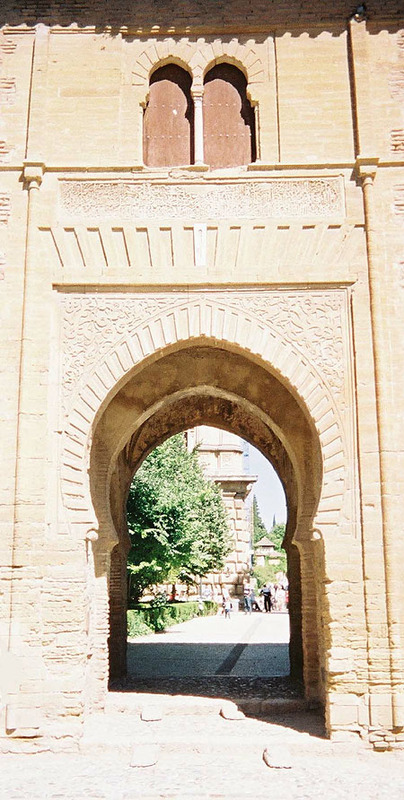 Access from the city to the Alhambra Park is afforded by the Puerta de las Granadas (Gate of Pomegranates), a massive triumphal arch dating from the 15th century. A steep ascent leads past the Pillar of Charles V, a fountain erected in 1554, to the main entrance of the Alhambra. This is the Puerta Judiciaria (Gate of Judgment), a massive horseshoe archway, surmounted by a square tower, and used by the Moors as an informal court of justice. 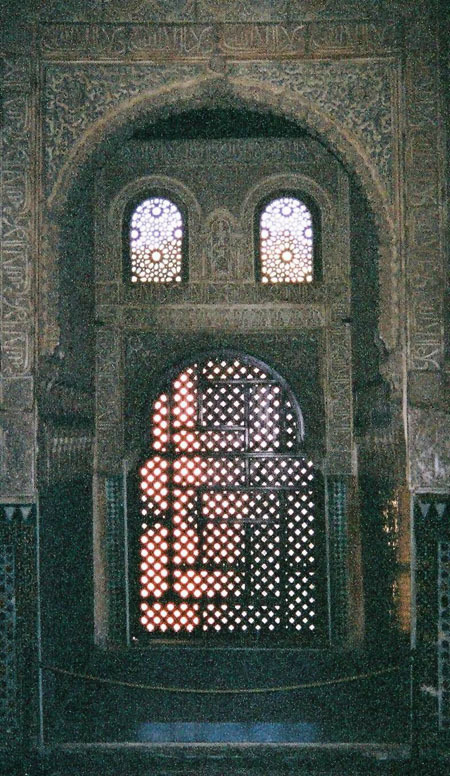 A hand, with fingers outstretched as a talisman against the evil eye, is carved above this gate on the exterior; a key, the symbol of authority, occupies the corresponding place on the interior. A narrow passage leads inward to the Plaza de los Aljibes (Place of the Cisterns), a broad open space which divides the Alcazaba from the Moorish palace. To the left of the passage rises the Torre del Vino (Wine Tower), built in 1345, and used in the 16th century as a cellar. On the right is the palace of Charles V, a cold-looking but majestic Renaissance building, out of harmony with its surroundings. Its construction, begun in 1526, was abandoned about 1650. 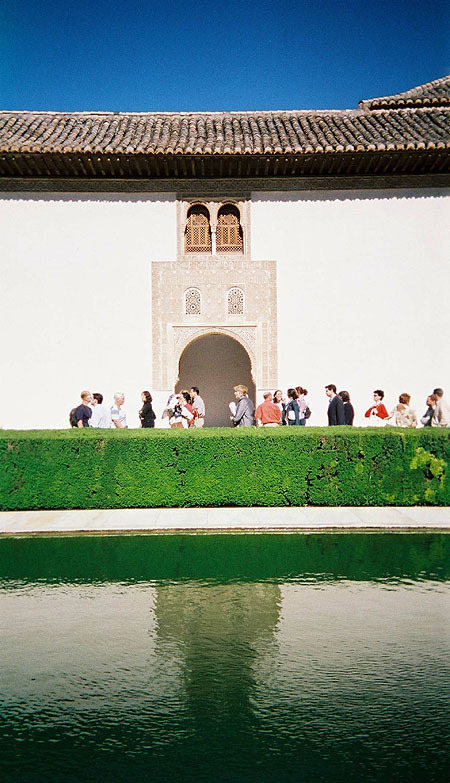 The Salón de los Embajadores (Hall of the Ambassadors) is the largest in the Alhambra, and occupies all the Torre de Comares. It is a square room, the sides being 37 ft. in length, while the centre of the dome is 75 ft high. This was the grand reception room, and the throne of the sultan was placed opposite the entrance. The tiles are nearly 4 ft high all round, and the colours vary at intervals. Over them is a series of oval medallions with inscriptions, interwoven with flowers and leaves. There are nine windows, three on each facade, and the ceiling is admirably diversified with inlaid-work of white, blue and gold, in the shape of circles, crowns and stars–a kind of imitation of the vault of heaven. The walls are covered with varied stucco-work of most delicate pattern, surrounding many ancient escutcheons. 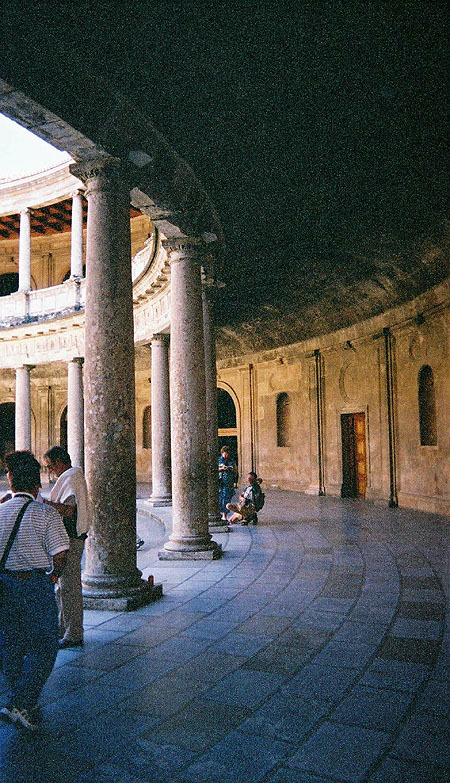 The celebrated Patio de los Leones (Court of the Lions) is an oblong court, 116 ft in length by 66 ft in breadth, surrounded by a low gallery supported on 124 white marble columns. A pavilion projects into the court at each extremity, with filigree walls and light domed roof, elaborately ornamented. The square is paved with coloured tiles, and the colonnade with white marble; while the walls are covered 5 ft up from the ground with blue and yellow tiles, with a border above and below enamelled blue and gold. The columns supporting the roof and gallery are irregularly placed, with a view to artistic effect; and the general form of the piers, arches and pillars is most graceful. They are adorned by varieties of foliage, etc. ; about each arch there is a large square of arabesques; and over the pillars is another square of exquisite filigree work. In the centre of the court is the celebrated Fountain of Lions, a magnificent alabaster basin supported by the figures of twelve lions in white marble, not designed with sculptural accuracy, but as emblems of strength and courage. It has been said that the lions were most likely sculpted by members of the Caliphate’s Christian community, as making such representational sculpture was not considered allowed by the followers of Islam. 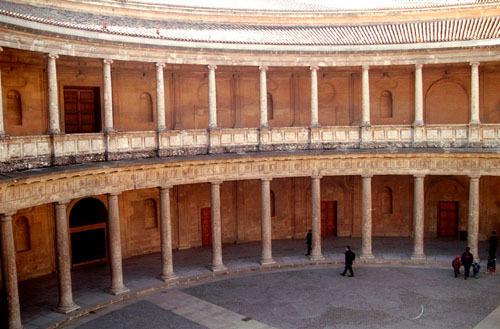 The Sala de los Abencerrajes (Hall of the Abencerrages) derives its name from a legend according to which Boabdil, the last king of Granada, having invited the chiefs of that illustrious line to a banquet, massacred them here. This room is a perfect square, with a lofty dome and trellised windows at its base. The roof is exquisitely decorated in blue, brown, red and gold, and the columns supporting it spring out into the arch form in a remarkably beautiful manner. Opposite to this hall is the Sala de las dos Hermanas (Hall of the two Sisters), so-called from two very beautiful white marble slabs laid as part of the pavement. These slabs measure 15 ft. by 7 1/2 ft., and are without flaw or stain. There is a fountain in the middle of this hall, and the roof–a dome honeycombed with tiny cells, all different, and said to number 5000–is a magnificent example of the so-called “stalactite vaulting” of the Moors.